Cute cover! Cute cover! I actually bought this because I was looking for something published by Hana to Yume. I had been buying a lot of Flower Comics again recently, and I wanted a change. Here is a cute story that I look forward to reading more of. 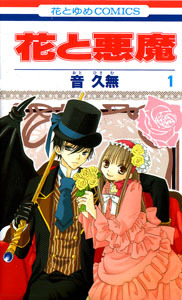 I think this is the first manga by this author, but I think their art style is sort of similar to some other Hana to Yume artwork I have seen on covers recently. Anyway, this is a vampire story! Well actually, in this book they seem to be just called ‘devils’ but it is pretty obvious they are vampires. The story begins with an abandoned baby. In the front porch of a fine old-fashioned castle, a young man finds a basket containing a crying baby girl. The young man, dressed in fancy 19th-century-style clothes, is surprised to find the baby, but reluctantly brings it indoors, keeping her as far away from him as possible. The household staff is equally surprised by her arrival. The child seems to have taken a liking to the young man, because she stops crying when she looks at him. Her smile is so prettym that they decide to name her “Hana” or flower, after the red roses on a nearby table. She outshines the real flowers. Flash forward a few years, and Hana is now a cute young lady. Strangely enough, the young man who found her looks exactly the same as he did those years ago. His name is Bibi, and Hana loves him very much. She is very playful around him, and pretty much follows him everywhere. All the castle staff like having Hana around, and she is well-loved. For his part, Bibi treats Hana with affectionate tolerance. He likes having her around, but she is just a human child, and he never allows himself to touch her. Bibi is so cautious because he is a demon, a creature that lives on human blood, and can sprout wings. He periodically goes out to the city below to find a willing victim. Hana has been raised in Bibi’s household, and knows exactly what he is, and has no fear of it. As a smaller child, she always followed Bibi around the castle, smiling at him and being so cheerful. Yet in spite of her adoration, Hana is very frustrated that Bibi won’t drink her blood. His habit of keeping away from her is also frustrating. Will he ever see how much she loves him, or whill she always just be a child in his eyes? Could the fact that all flowers wither to dust at his touch be the real reason he is keeping her away? I don’t think it’s available in the USA yet. I wouldn’t be surprised if it gets picked up soon though.